Original cartoon appeared in the Evening Standard June 1940 after Dunkirk evacuation & surrender of France, by David Low with caption “very well, alone then”. The summer of 2015 brought a spectacularly bright ray of progressive hope to the United Kingdom: the increasingly obvious likelihood that a socialist would soon lead the near-moribund Labour Party. After almost 20 years of Thatcher-lite neoliberal policies, the grassroots membership voted overwhelmingly for Jeremy Corbyn to take leadership of the Labour Party. The progressive victory proved short-lived. Less than year later, the far Right would achieve its greatest victory in British electoral history, winning the IN/OUT referendum on the European Union through a campaign of flagrant xenophobia and racism. Attempts to portray the referendum result as a rejection of globalization, an opening for “progressive nationalists,” or a recapturing of democracy lost to Brussels confront an extremely inconvenient fact: the most reactionary UK political party drove the OUT campaign with a message of fear of foreigners and especially of Muslims (see UKIP poster). 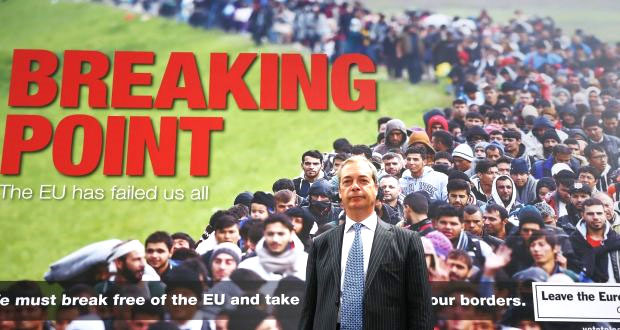 United Kingdom Independence Party (UKIP) leader Nigel Farage standing in front of a UKIP poster showing a crowd of alleged EU immigrants with an obvious implication of a Muslim horde. The post-referendum misrepresentations rival and reflect the lies peddled during the campaign. First and foremost, the suggestion that the British Isles would enjoy more “sovereignty” outside of the European Union is nonsense. The grain of truth in that campaign assertion is that capitalists operating in Britain will enjoy less regulation, because UK consumer protection, guarantees of workers rights, and restrictions on environmental degradation are far stronger in EU law than British law. Second, the infamous and eponymous “Brussels bureaucrats” exert almost no influence, much less control, over British economic policy. The British government refused to join into the package of fiscal rules that are the most pernicious element of the EU Treaties (Britain has a formal “opt-out”, as does Denmark). The savage policies enforced on Greece and to a lesser extent Ireland, Italy, Portugal, and Spain would be impossible to implement in Britain, because they derive from membership in the eurozone (the British government also negotiated an “opt-out” from the requirement that if it meets specified criteria a country must join the eurozone). Third, for better or for worse with the exception of Scotland the referendum outcome will not encourage separatism in the European Union. On the contrary, the boost of right wing parties will lead to them overwhelming the few substantial separatist movements on the continent, most obviously in Spain. Fourth, I am very skeptical that British withdrawal will prompt “reform” of EU governance of any type (see the hopeful article by German parliamentarian Norbert Röttgen, no doubt sincere but fanciful). The German government’s power over EU decisions varies between strong and hegemonic. That power and the austerity policies it has forced upon the continent very much serve the interests of German industry and banks. Domestic austerity keeps wages and thus export costs down; austerity for the rest of the eurozone enforces the servicing of public debt held by German banks. More likely than German led reform is German enforced consolidation of a smaller European Union around appallingly reactionary domestic policies and a mercantilist trade strategy. Above all the referendum outcome means strengthening right-wing political parties and ideology on the continent and in the British Isles. This fallout from a campaign of overt xenophobia and thinly disguised racism should surprise no one. Progressive forces in the British Isles have suffered a triple blow. First, the strong OUT vote in England (53%) and stronger IN vote for Scotland (62%) lay the basis for a second Scottish independence referendum. In 2014 the independence referendum lost 45% to 55%. However, Scotland’s First Minister Nicola Sturgeon, perhaps the canniest politician of the British Isles, may read the Brexit result as a harbinger of success for a second referendum. Should a majority of Scottish voters choose independence it would prove virtually impossible for the parliament in London to prevent a breakup of the United Kingdom. The consequence for progressives of a “Great Britain” made up of England, Wales and Northern Ireland would be dire. The likelihood is extremely low of the Labour Party winning a majority of the parliamentary seats in England. In Wales, the Labour Party holds most of the seats, but they are few in number—only 40 of 650 (with 59 in Scotland). For decades, the Labour Party could hope for Wales and Scotland to cover its losses in England and Northern Ireland, but Scottish independence would mean either a near-permanent Conservative majority in “Britain” or a Labour Party re-conversion to neoliberalism to court voters in the South of England. The second blow arrived quickly: an attempt by the center-right of the Labour party to depose Jeremy Corbyn from the leadership. Since the moment of Corbyn’s election as head of the party the so-called Blairites have conspired to undermine his leadership. Their objection to Corbyn is political: he fights for a re-invigoration of social democracy based on trade union support, and the Blairites seek to maintain neoliberalism in the interest of capital. Those Labour Party MPs who led the coup have more in common with the Conservative Party than with Corbyn. They favor renewal of the country’s nuclear weapons, reduction of the fiscal deficit through expenditure cuts, and support for the financial sector. Right-of-centre Labour abhors the policies that won Corbyn the leadership: commitment to terminate nuclear weapons, end austerity, and tight regulation of “the City”. As I write this article, the Parliamentary Labour Party is in the process of voting overwhelmingly to pressure Corbyn to resign. Because of his grassroots support and the rules for electing Labour leaders, the vote, likely to be more than two-to-one against Corbyn, cannot in itself depose him. But at best Labour’s first social democrat leader in decades will be severely weakened. This intra-party challenge to Corbyn follows directly from Brexit. Perhaps even more serious is that the OUT victory has unleashed a wave of overt racism. Only four days after the referendum, the soon-to-be-replaced Prime Minister David Cameron found it necessary to denounce what he called “despicable” acts against foreigners throughout England (watch speech on the BBC). Aditya Chakrabortty, Guardian journalist, pointed out the irony: Cameron ran a pro-EU campaign with a promise to reduce migration and now is forced to denounce the xenophobic results of that promise. Independence of Scotland leaving a neoliberal rump Kingdom, near-fatal weakening of a progressive leader, and a rising wave of racism—these are the fruits of victory for the pro-Brexit forces. If anyone hoped that Brexit would strengthen progressive forces on the continent those hopes quickly evaporated. Quite the contrary has occurred with alarming rapidity. On the Sunday after the UK referendum Spain held its second general election in less than a year. In December 2015 Europe’s largest progressive coalition, Podemos, came close to an electoral break-through. It won 20% of the vote in its first entry onto the national scene, less than two percentage points short of replacing the Socialists as the leading opposition party. The inability of any grouping to form a government resulted in a second election, held last Sunday. Polls suggested that the broadened coalition, Unidos Podemos, would leap past the Socialists to second place nationally, laying the basis for a new Spanish government committed to end austerity. In the event the Right gained. Seats won by Unidos Podemos came from the Socialists, a swap within the left of center. After substantial losses in December 2015, the right-wing Peoples’ Party gained fifteen seats and will continue its hold on government. Elsewhere in Europe the Brexit vote emboldened the ultra-right. In France Marine Le Pen, leader of the neo-fascist National Front, immediately promised an OUT referendum. In the Netherlands, the virulently anti-Muslim politician Geert Wilders called for a referendum on EU membership. Were this to occur, it would follow closely on the Dutch electorate’s defeat of a referendum for closer links between the European Union and Ukraine in which Wilders played a prominent role. A majority of working class and poor white English men and women voted to leave the European Union. To consider that vote as progressive because of its class origin represents the equivalent of taking a favorable view of Donald Trump because he harvests the votes of white working class Americans. Not everyone, or even most, of the people who voted leave were driven by racism. 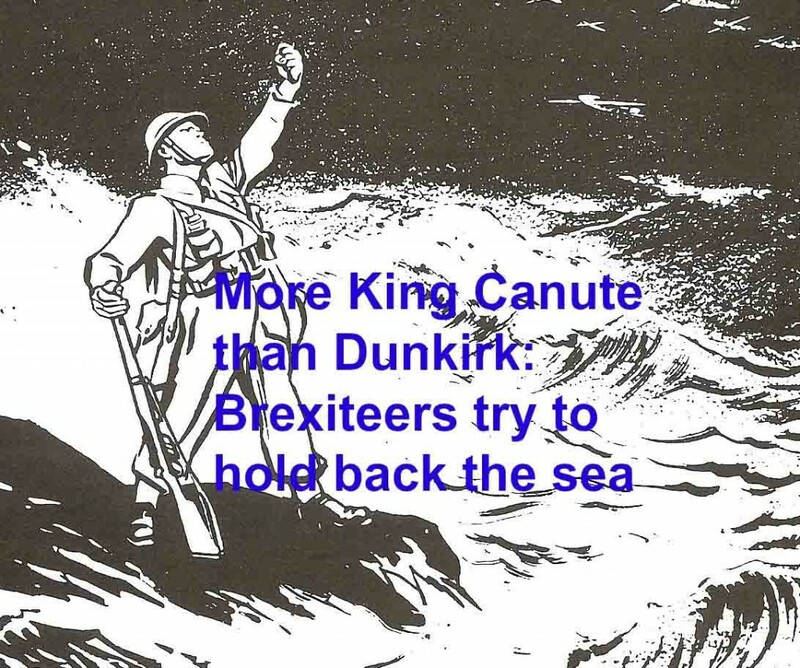 But the leave campaign imbued racists with a confidence they have not enjoyed for many decades and poured arsenic into the water supply of our national conversation. It may be that this surge of the Right and weakening of progressive movements will prove a passing moment, soon to be replaced by a blossoming of Brexit-provoked grassroots democracy and social democracy throughout the British Isles and the European continent. But don’t plan on it, because there is no indication of it. John Weeks is a professor emeritus at the School of Oriental and African Studies at the University of London.